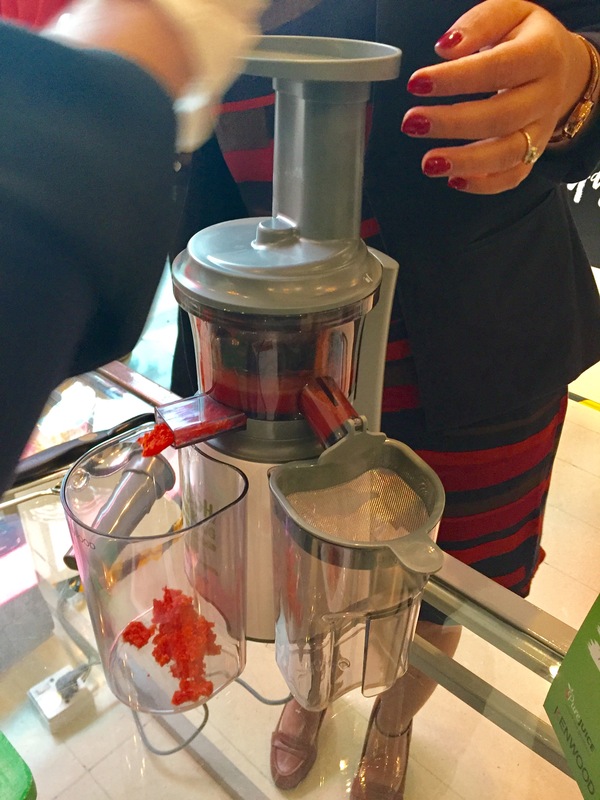 A few weeks ago I was invited down by the Kenwood team to test out their brand new range of PureJuice slow press juicers. We all know that making our own juices and smoothies is very much “on trend” at the moment, but regardless of whether it is “cool” or not at this given moment, it is for sure a great and convenient way to incorporate a healthy diet in the fast paced lives we lead. Personally, I’m a huge fan of a big glass of the Cocktail Juices at any local cafeteria, and as unwilling as I am to share it, Baby Z tends to drink up almost half of it on his own. 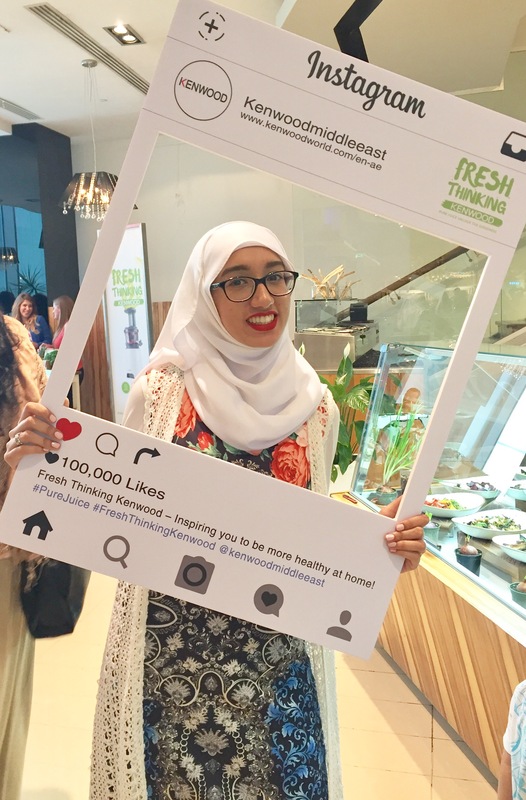 Therefore, I was keen to go along and be inspired to create my own delicious and healthy juices right at home, and at the same time find a different way to offer fruits and vegetables to Baby Z. 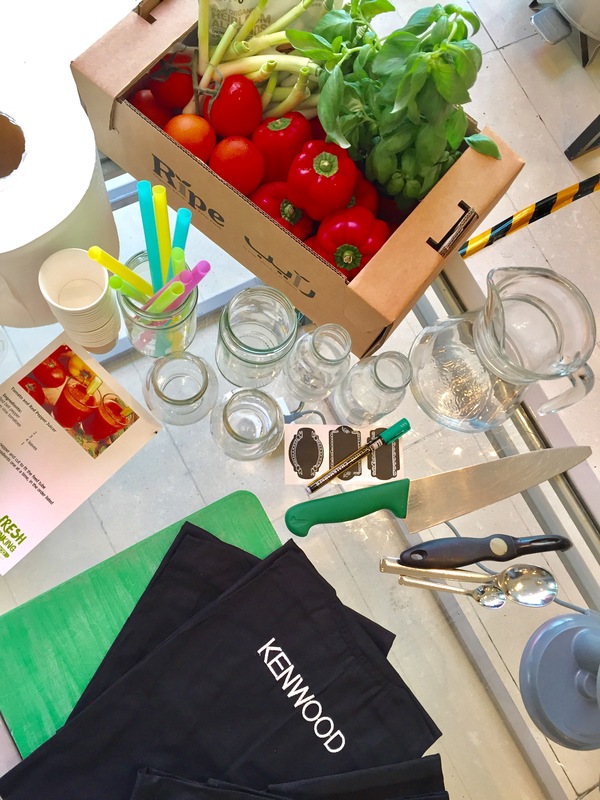 Hosted by Dr. Lama Alnaeli, Kenwood’s Health Ambassador, the event had us testing out the PureJuice juicers and creating different juice recipes. 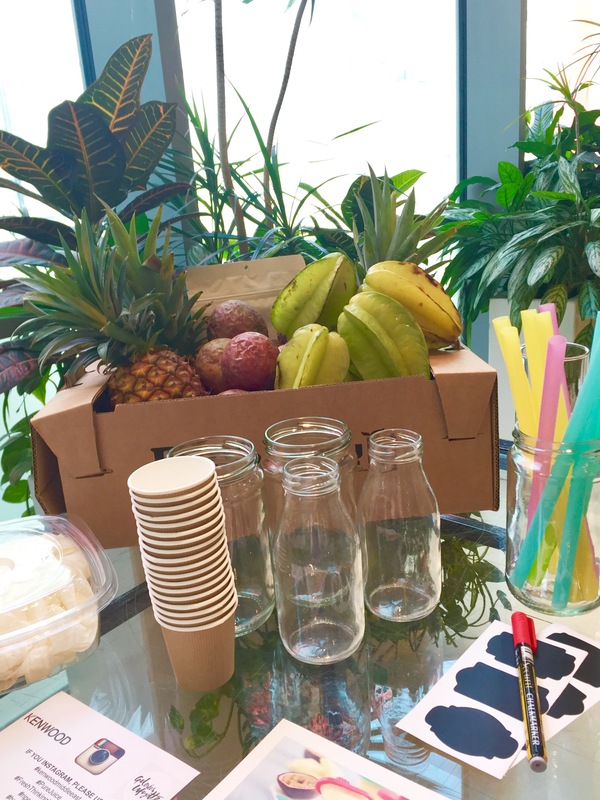 We were given a brief introduction about the process of slow juicing and how their new Fresh Thinking campaign advocates for health and wellness. 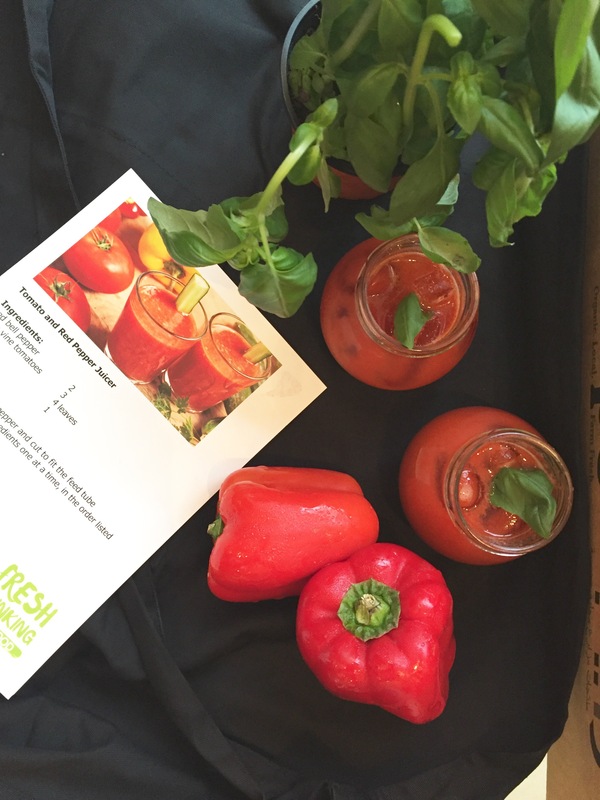 Ingredients: 2 red bell Peppers, 3 plum vine Tomatoes, 4 Basil Leaves and 1 Leek. Method: Destalk the pepper and cut to fit the feed tube. Juice all the ingredients one at a time, in the order listed. Serve over ice. As the picture above shows, you feed the machine with the ingredients at the top, after which there are two outlets. One is where the fine juice comes out of, and the other is from where the dry pulp is extracted. You can opt to put a sieve at the end of the juice outlet to remove any excess pulp, but we decided to leave it in as the whole team preferred juices that contain pulp. The Tomato and Red Pepper juice came trickling and vibrant in colour, but was a little too peppery for my taste. I went ahead and tasted the juices from the other teams, steering clear of the detox juice because they just aren’t my thing and I much prefer sweet juices. My favourite by a mile were the Tropical Lollies, of which the juice form was just as delicious. I think Baby Z chugged down about 4 to 5 shots of those before he managed to get his hands on one of the already prepared Tropical Lollies, and this time I didn’t have to stop him because I knew they were completely healthy! Here’s the recipe in case you want to try it out! Method: Peel and cut the pineapple to fit the PureJuice feed tube. Scoop out the passion fruit seeds just before juicing. Juice the ingredients one at a time, in the order listed. Pour the juice into ice lolly moulds and leave to freeze overnight. The juice version of this was so sweet, refreshing and delicious, so if you didn’t want to make ice lollies from it, simply juicing them is perfect too! PureJuice (JMP600WH/SI)–999AED/ With Sorbet Attachment: 1,099AED: PureJuice is Kenwood’s new Slow Press Juicer that comes in silver or white. An effortless way to engage in a healthier lifestyle through consuming 100% natural juice. By slowly crushing ingredients PureJuice can extract up to 84% of juice and retains maximum taste, colour and nutrition. PureJuice PRO (JMP800SI) -1,299AED: PureJuice Pro makes it safe and easy to create delicious, healthy juice with a high extraction rate of up to 81%. There is no need to cut up fruit or vegetables before they go in, and the powerful motor means you can be enjoying your juice in seconds. Kenwood kindly gifted me with a PureJuice (JMP600WH/SI) so that I was able to test it out rigorously myself before giving you my opinion. After giving it a spin at home, I can tell you its super convenient and I have enjoyed experimenting with different fruit and vegetable combinations. It’s nice to be able to offer Baby Z’s daily portion of fruit and vegetables in an alternative way. The juice comes out pretty fast, and I like that you don’t necessarily need to peel every item (especially apples!) before juicing it, making the process much faster. I do wish the feeder tube was a little wider so I could put in bigger chunks, but I guess to answer that question there is the Dual Whole Apple Feed Tube in the PureJuice PRO version where you can fit in much larger ingredients. A Juice Jug and Pulp Container is provided with the juicer and I appreciate the Anti-drip stopper on the juicer outlet to ensure no spillages or drips. The design is sleek and the machine is small enough as far as juicers go, so when I am not using it, I can store it inside my kitchen cupboard. The top part (Lid and Feed Tube) comes off so it can fit into smaller spaces. My only complaint is that there are many components to clean once you are done with juicing. The toughest part is the end from which pulp is removed from the juicer as it can get clogged with solid pulp. I was advised that once juicing is complete, to simply go through the juicing process with some water to loosen it up and makes cleaning it easier, which it very much does. A cleaning brush is also provided, but I did find I was using a smaller cleaning brush to really get into the nooks and crannies of the machine. The juicer itself juices very nicely and the outputs are delicious. My next mission is to make my own Almond Milk at home using the Kenwood PureJuice. Overall, I think it is a great investment if you are looking to lead a healthy lifestyle and want to be able to make your own juices efficiently. This product is perfect for Fitness lovers and Mums on the go who need to fuel up their tots with a healthy treat in between extra curricular classes. For more information on the Kenwood PureJuice range, head to their website here or head to your local Kenwood outlet. Likewise, follow the #FreshThinkingKenwood campaign over on Instagram to stay up to date as well as discover delicious juice recipes! Have you tried the Kenwood PureJuice slow pressed juicers? What’s your favourite kind of juice that you would like to create with them? Feel free to share your thoughts in the comments section below! Note: This post was written in collaboration with Kenwood, however all views and opinions expressed above are honest and solely my own.